Watch has picked up the mantle over in the UK. Now lets be having you stateside. Agreed! Or way more than one! Very excited that they mentioned the #FreeBabylon5 campaign! I am a bit suspicious about this. We are talking about a channel choosing and putting on a show in only a few days. Too fast (unless a second show fell through). 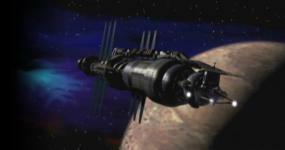 I wonder if the FreeBabylon5 was a cheap viral advertising campaign? Hmm. Good point. Hopefully JMS wasn't in on the ruse. What makes you think that it was chosen and a deal struck in only a few days? The only few days involved is the time between the announcement and the first episode. I don't know anything about UK scheduling but that doesn't seem unusual to me. And I have no problem helping them promote this since they're also promoting the #FreeBabylon5 campaign. That's the point. Did JMS start his campaign for B5 on TV after he knew it was going to end up on TV in the UK? There’s a lot of tripe following the announcement as well. Though that kind of hype is not that unusual. Take this announcement over on Giant Freakin Robot with comments like this. Fact is, it’s been running in one foreign market or another almost continuously since the original series ended!! Watch is just the latest in the UK – with Bravo having shown it until 2011, and I think the FX (Fox) channel just finished showing it last year. I know Joe has said it’s up to the fans and he has to stay out of it (though I'm not sure why), but I’ve read numerous announcements now on various ‘news’ sites and not one of them is pointing to the likes of the #freebabylon5 page on facebook or the website. I know I’ll get shouted at for pointing this out, but the only thing being pointed to is jms on twitter and jms on facebook. Just posted a shot from near the start of the video. Though I imagine the full thing will be up on Youtube soon enough. Last edited by Triple F; October 30th 13 at 05:42. Which time do you mean? The time he 'started his campaign' in May? Or the time he 'started his campaign in July? Or this latest one? Because he made essentially the same comments that sparked #FreeBabylon5 at appearances at the Phoenix Comicon and at SDCC as he did on Twitter and on Facebook in Sept. If it were his campaign, I probably wouldn't need a Donate button on the website! Well, he did spark the whole thing. It's much easier to point to him than to the 4,139 (at the time) tweeters or the 2,780 (now 2,831) Facebook 'Likers'. Heck it's his quotes that are at the forefront of the website. That said, this site is where I picked up those figures above and Digital Spy seems to focus a lot on what the fans have done. Darn! Now I know how non-USians feel about region locking. I can't access it and I'd love to see it. Definitely sounds like there's a big fan at Watch. the trailer on watch is pretty amazing. I just hope they give B5 the attention that it truly deserves. and to think My son (now nearly 20) was on at me the other day to dig the DVDs out. Now he can watch one episode a day on Watch. Kudos to them. Congratulations to all - the first step has been taken.... hopefully more to follow. It is odd that shows like B5 and Farscape don't have a daily spot on SyFy. But then again that channel went to complete crap. Cable TV is really about niches and SyFy pretty much abandoned theirs. And there's no one out there to take their place I guess as they won't make money airing them.